'Earth Experience': Listen to .. 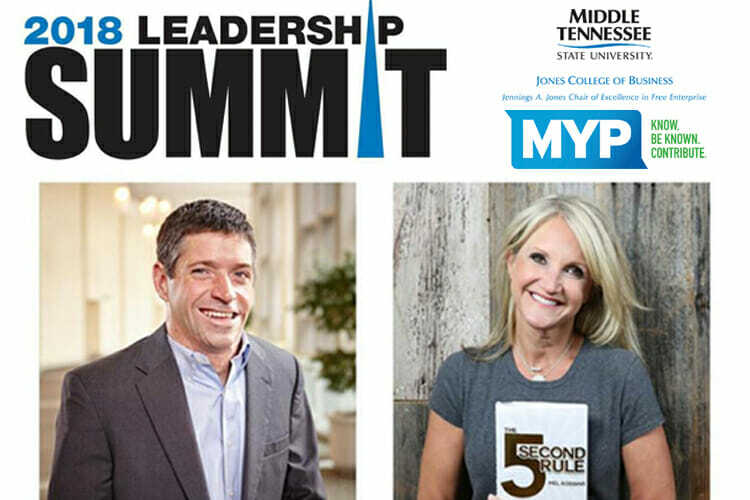 Raider Review: September 14, 2..
Two nationally known speakers will offer insights on leadership as well as personal and professional development during keynote addresses at this year’s Leadership Summit hosted by MTSU’s Jennings A. Jones College of Business. Registration is open for the 2018 summit, which will be held from 10:30 a.m. to 1:30 p.m. Friday, Sept. 28, at the Embassy Suites Murfreesboro, 1200 Conference Center Blvd. Registration cost for the general public and a conference outline can be found at www.mtsu.edu/business. The registration deadline is Friday, Sept. 21. The focus of this year’s conference is the passion and innovation needed by leaders who want to grow their businesses. Jones College Dean David Urban said attendees can expect another impactful conference, which last year featured “Shark Tank” star Daymond John and online magician Vinh Giang. • John O’Leary, a stimulating speaker and life coach and author of the book “On Fire,” will motivate and inspire with the tale of his against-all-odds survival from a horrific accident in his childhood, organizers said. O’Leary will apply the lessons he learned to the challenges faced in all walks of life, including business. • Mel Robbins, a serial entrepreneur, CNN contributor and author, will offer problem-solving techniques based on her best-selling book, “The 5-Second Rule,” a fixture on Amazon’s “Top 20 Most Sold & Most Read List” and one of the most successful audiobooks ever published. Her digital platform inspires more than 20 million people a month and her TED Talk about change has more than 10 million views. Murfreesboro Young Professionals, the Jennings A. Jones Chair of Excellence in Free Enterprise and the Jennings and Rebecca Jones Chair of Excellence in Urban and Regional Planning are event sponsors. The event is free to MTSU faculty and staff, but registration is still required. For more information, visit www.mtsu.edu/business.